Etsy is a great place to start out with an online business. Don`t get me wrong, I love the place. But if you have been running your Etsy store for a while, you might start to ”out grow it”. If you are growing and expanding, setting up your own website now, to prepare for the future is your best solution. If you are just starting out, using your own website to build a brand will only benefit you going forward. When you use a third party site to run your business, in this case Etsy, you have to follow their rules. Their site their rules, right? It makes sense. If they make changes, you have no say but to follow those changes. If they decide to increase fees, for example, you will have to adjust to that and either charge more for your products or reduce your margins. There has even been cases where Etsy has shut down stores, over night. They can make any changes, that might effect your business in a negative way and you have no control of it. Having your own website will put you in 100% control. You decide what goes up on your website. You decide what to write about. You decide what to sell and what to charge. Having your own website, looks professional. If you take your business seriously and you want others to as well, having a website will be essential. If magazine, retailers or other potential partners search for you and there is no website to be found, they might not find you to be serious about your business. With a website you can also give more information about your products and company. If you do have a website, you are serious about your business. 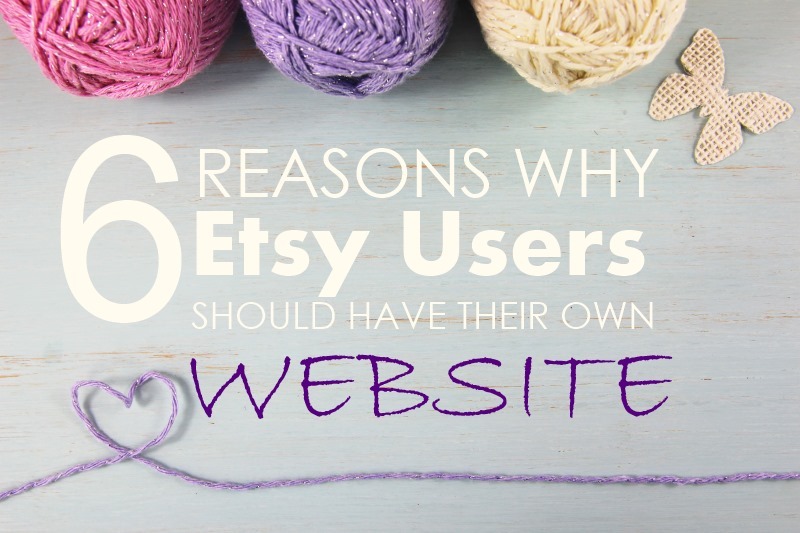 Etsy is limited when it comes to what you can do with your website. It can be hard to stand out from the crowd. Having your own website will allow you to tell your story, in any way you want. You can add text, videos and photos and design it in a way that represent you and your products. You can also blog on your website so that visitors get to know you, your products and your brand. Your own website will be much more visually appealing than an Etsy store with limitations. Plus you don`t have to compete with hundreds of others selling the same kind of products. Ranking content ”organically”, meaning free, in Google and other search engines can drive a lot of visitors to your website. You will get in-front of people that are searching for what you are offering. There are ways to rank for specific keywords in Google. Let me give you an example. Say that you are selling ”charm bracelets for girls”. 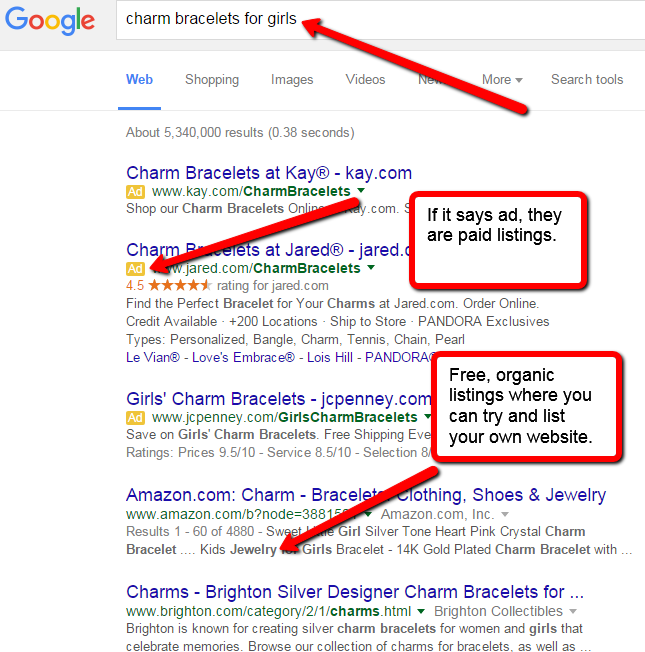 There are tools to tell you how many people search that phrase and how hard it would be to rank for that in Google. My keyword tool tells me there is an average of 699 people searching for ”charm bracelets for girls” each and every month. When I put that phrase into Google, Etsy show up first on page 3. I don`t think I have ever looked as far as page 3 on Google for anything I search. If you have your own website, you can rank for that term. Using Google and other search engines, is a free way that can generate a ton of traffic for you, by ranking for numerous relevant phrases. Starting out you can then direct those visitors to your Etsy store, until you have your own store set up on your website. Does it sound overwhelming? Don`t worry and don`t get discouraged. That`s how we all start and there is help to get. There is step by step free training to set up your own website, we will talk about that at the end of this article. With Etsy you can only create an email list with your buyers. When using Etsy you can not collect emails from your potential customers. This is easy to do with your own site, collect emails from your visitors. You want to do this so that you can keep potential customers, updated with your site, products and other news. Your email list can be a gold mine. Imagine being able to send out an email to all your customers and even potential customers, when Christmas is around the corner, that could potentially bring in some good sales for you. With a website you can build and grow your brand. If somebody buys something from your Etsy store, they will refer to it as a “Etsy purchase” to family and friends. If they buy it directly from your website they will refer to your website name. Having your own site will allow you to brand you and your business. If you have an Etsy store that brings you good sales, DO NOT get rid of it. Ok, just wanted to make that clear. What you should be doing along side with your store is start planning and building your own website. Down the road you can add a shopping cart, display and sell your products on your own site. When you have that up and running, you can start promoting your site. One thing you can do is to include a business card or even a coupon with your Etsy sales where you direct them to your own site. Another thing, price your items slightly lower on your own site compared to your Etsy store. Now we are getting a head of ourselves, let`s get back to how to start your own website. Instructions on how to set up your website, on your own domain and hosting. Learning the basics of WordPress, the platform I suggest you work with. How to set up your own store/shopping cart on your website. Again, don`t let this overwhelm you. With step by step instructions you can do it all! Read my post – Step-by-Step Instructions to Get Your Own Website Up and Running. Find a program that help you grow your site. A program with not only training, but support. I`m a member of an online training center that can help with this. You can read my review about it here and see if it`s for you. If you are doing pretty well with Etsy or want to build a brand, a good time getting your own website started is now. Diversifying your sales channels will only benefit you. 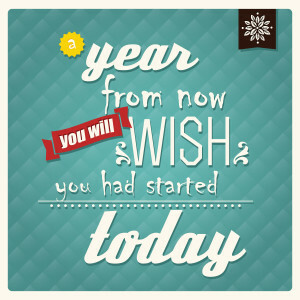 The sooner you get started, the sooner you will have control over your business. If you have any questions or need my help getting started feel free to leave a comment below and I will get in touch. What`s your take on this, do you think Etsy users need their own website? You make some excellent points! One thing I’d like to point out is #5 as you can collect emails in Etsy. I’ve been collecting emails and using it mainly to offer customers discounts that are special for them. I also email my list to answer FAQs, to showcase my new products, and to ask them what they’d like me to create next.. Thank you for your input Peg! Now can you collect emails from visitors that do not purchase your products or are the emails you are talking about from former customers? Thank you Peg, glad you enjoyed the read. Oh good point. You can collect emails on Etsy, but only after they purchase. You definitely need a website in order to entice non-buyers or future buyers 😉 to sign up to your list. Thank you for making that clear Peg. I will make sure so that`s clear in the article as well.